For me this is all about stop trying to be the thing you think you should be and just be whatever it is you are. Granted, who we are are ever-evolving beings and what we are now is not what we were, or what we may become; but that is all the more reason to let go of a fixed idea about who we should be because it will never keep up, or even accurately predict the future you anyway. I’m going through a big shift these days myself, so this is something I spend a decent amount of my brain pondering. There’s a strange sense of clarity combined with sightlessness in this time for me. Clear ideas of what I was, and what I need to move away from, and some hints of where I am going next, but aside from trail-markers of sorts, I’m not really sure where that will end up. Re-inventing yourself involves invention of something that didn’t exist before, so how can you know what that is until you discover it? There’s a patient plodding to my existence these days, each step unfolds a bit more of the mystery. And if I can relax into it, there’s a delightful sense of discovery that overrides the frustration of not knowing. I’ve just started reading Stephen King’s Dark Tower series; aside from knowing it is an Epic with a Long Journey and many stories, I know little about it. It is a joy to read however, for all Mr King’s twisted dark plot brain, his prose is beautiful. I love the quiet wandering of the gunslinger, that sense of a Great Tale unfolding, so little of it I know or understand right now. The gunslinger and I are travelling a similar path (though hopefully I won’t have to shoot so many people). 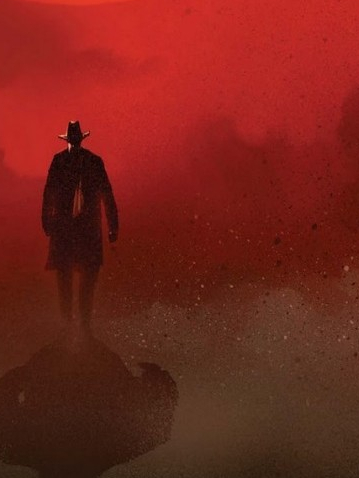 He’s got some little clarities that move him forward: heading southward, the pursuit of the man in black, the ever present influence of the Dark Tower; but aside from a sense of a great unfolding, little is know of where it all will end up. Me too. I’ve got the read of my internal compass telling me what direction to head, the steps that are right in front of me, but no knowledge of where the great unfolding of my own mystery will take me. I’m trying to just roll with that, and trust an inner wisdom. Because as soon as I get an “idea” of what it is I should become, I box that unfolding in, limit the space of what it can become, warp and stunt its growth. So stop trying to be the idea of who you think you should be, just do the job of who you are in this moment and let it slide on into the past. Your future awaits, unfolding at your feet, one step at a time. Nice post Valerie – I wish you well on your journey (and hope to see you soon)! Oh THAT is brilliant! Well said.